I want to draw text in a image, using Imagick and PHP7 (support by Hostgator). I have problem when the text is very long, i don't want to wrapping (new lines), I want to scale width of the text (height is a constant). Here is a Demo that I want. 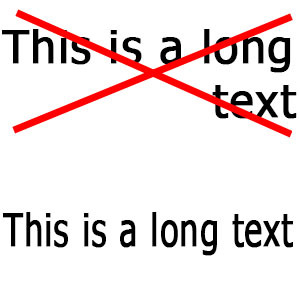 You can create an image just for the text using "label:". If the result is wider than you want, resize it down. See https://imagemagick.org/Usage/text/#label. Sorry, I do not know the MagickWand equivalent. ... and if that image is wider than you need then resize it down, then composite that over your main image. I don't use PHP. Refer to documentation for the correct syntax etc.